Oskari Saari: From the Arctic Lapland Rally, the WRC-season will become extremely interesting, there’s Hirvonen, there’s Räikkönen and of course that Loeb-troll but let’s see now how Arctic Lapland Rally will go. Anette: Kimi Räikkönen stepped in front of the media for the first time as a WRC-driver on Thursday. The laidback Räikkönen chatted about this and that but assured that he is in rally with a serious intention. Kimi: Well, I don’t think I would go driving if I wouldn’t be interested. It has never been up to interest, otherwise I would have retired a long time ago. Nobody forces me to do it and I don’t have to do it if I don’t want to. Of course we always try to do our best and go as fast as possible but I have to be realistic, we have a lot to learn so it doesn’t happen really quickly. Maybe it’s more easier in F1, you drive the same car on the same track so that you know what to anticipate during every lap but in rally there are so many things that change so you have to make the right choices really quickly. Let’s see what happens. 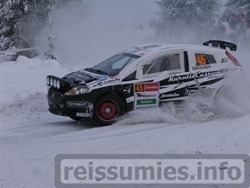 Anette: Arctic Lapland Rally started on Friday. The first stage was as success story for Räikkönen. Kimi was 2nd fastest only 5 seconds behind Sordo. On the second stage the Newton’s laws came in to the picture when the speed and grip didn’t match anymore. Räikkönen heard the note wrong and the Citroen took off like a button from a shirt. Kimi: There was a tree as thick as a leg and we went right through it but those things happen, that’s why we came here, to learn everything. It was a tricky weather, it was snowing and my headlights were too high and I couldn’t see anything. All kinds of things, on one stage the crossroad went too far so we had to reverse. A lot has happened but it’s good. That’s why we came here so that we could screw up what can be screwed up and learn from that. Kaj Lindström: We came from the jump straight and tightening 3 and Kimi came to the corner and turned a bit too roughly and it didn’t turn and he said: ‘It wasn’t 5 was it?’ and I told him that no, it was 3 and he admitted himself that he heard it wrong, understood it wrong but these things happen and you have to get used to it. If you go to anyone else you will hear long stories about how it just is part of the rally. Anette: Kimi wasn’t the only Räikkönen with bad luck in this rally. Kimi’s brother Rami rolled three times with his Fiat Grande Punto and this is the same car Kimi had in Jyväskylä last year. Rami Räikkönen: Well it wasnt Left 6. Anette: Apparently you used your brother’s notes from last year? Rami: Oh yes. Of course I had checked them myself but I still have to learn about that. Anette: Tell what happened, how many times did you roll etc.? Rami: The speed was 172 km/h, and it started rolling from the front, spectators said I rolled three times but I’m not sure. Anette: What happened to your nose? Rami: I guess the windows came in through my nose. Anette: They went to the night break with Dani Sordo leading. Juha Salo was second. Kimi was 74th and he already had over an hour’s difference to the lead due to the driving out. Mark Arnall was also in Rovaniemi, he has worked with Kimi ever since 2002. Training for F1 and rally is almost similar.